The Vedas are a large body of Hindu texts originating in ancient India, before about 300 BCE. Composed in Vedic Sanskrit, the texts constitute the oldest layer of Sanskrit literature and the oldest scriptures of Hinduism. Hindus consider the Vedas to be apauruṣeya, which means “not of a man, superhuman” and “impersonal, authorless”. 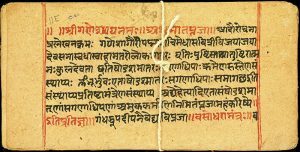 There are four Vedas: the Rigveda, the Yajurveda, the Samaveda and the Atharvaveda.Each Veda has been subclassified into four major text types – the Samhitas (mantras and benedictions), the Aranyakas (text on rituals, ceremonies, sacrifices and symbolic-sacrifices), the Brahmanas (commentaries on rituals, ceremonies and sacrifices), and the Upanishads (text discussing meditation, philosophy and spiritual knowledge).